This article is about Howard Earl Averill (1902–1983). For his son, Earl Douglas Averill (1931–2015), see Earl Averill, Jr.
Howard Earl Averill (May 21, 1902 – August 16, 1983) was an American player in Major League Baseball (MLB) who was a center fielder from 1929 to 1941. He was a six-time All-Star (1933–38) and was elected to the Baseball Hall of Fame in 1975. Born in Snohomish, Washington, Averill broke into the Major Leagues in 1929 (at the age of 27) with the Cleveland Indians. He played for Cleveland for over ten years, and remains the all-time Indians leader in total bases, runs batted in, runs, and triples. He also remains third in all-time Indians hits and doubles, and fourth in all-time Indians home runs and walks. During his time in Cleveland, the team never finished higher than third. His nickname was "The Earl of Snohomish". He famously hit the line drive that broke Dizzy Dean's toe in the 1937 All-Star Game. Dizzy, who had averaged 24 wins a season up to then, and only 4 wins a season after, changed his delivery due to the broken toe, damaged his arm, which led to his retiring in 1941 at the age of 31. Averill was the first Major League player to hit four home runs in a doubleheader (with home run in each game) on September 17, 1930; he was also one of the first players to hit a home run in his first Major League at-bat (April 16, 1929, opening day). 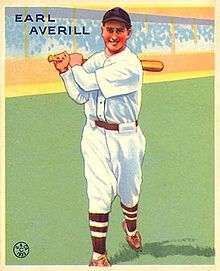 Averill batted .378 in 1936, leading the American League in hits with 232, but finishing second to Luke Appling in the batting race (Appling batted .388 for the White Sox). During a July 1 incident in 1935, Averill was lighting firecrackers with his four children as part of a pre-July 4 celebration. One exploded while he was holding it, and he suffered lacerations on the fingers of his right hand, as well as burns on his face and chest. After several weeks, he made a full recovery. Averill was traded to the Detroit Tigers in the middle of the 1939 season (June 14). The following season, his playing time was limited, but the Tigers reached the World Series. In the seven-game series against the Cincinnati Reds, the 38-year-old Averill went 0-for-3 in three pinch-hit attempts. The Reds won the series four games to three. Earl Averill's number 3 was retired by the Cleveland Indians in 1975. Averill retired in 1941 after struggling in April with the Boston Braves. After his career, he was very outspoken on being elected to the Hall of Fame. While he did not campaign for induction, he did make the statement that, "Had I been elected after my death, I had made arrangements that my name never be placed in the Hall of Fame." Averill was inducted in 1975, eight years before his passing. He made news of a different sort, according to Baseball Digest, in the early 1960s when he was boarding an airplane to fly to a site for an old-timers' game. He insisted on bringing his own bat in a gun case. His son, Earl D. Averill, also played in the majors from 1956 through 1963. He was mainly a catcher but also played left field and a few games at infield. ↑ "Earl Averill is Outstanding Rescruit of Season". The Pittsburgh Press. June 7, 1929. ↑ "Diamond Star is Pre-July 4 Victim". The Bend Bulletin. July 7, 1935. p. 1. ↑ "Baseball's Hall gets an earful".